While Moon wasn't given a typical wide release by Sony, Duncan Jones' little scifi drama has been steadily making its way into arthouse theatres across the world, picking up much praise along the way (my review). Hopefully by now there are many more of you out there who have been able to see it, but if not, know there is at least an R2 release coming at you for November 16 and a place like Quiet Earth where you can see weird artwork that didn't quite make it to your local theatre lobby. I particularly like this one to the right because it makes Rockwell look like he's an over-quaffed 70s folk rocker. 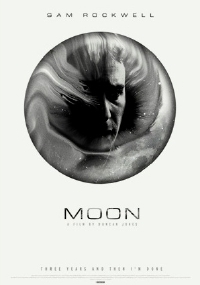 Check out all four unused posters for Moon after the break. Some cool artwork. I'm really looking foward to this one. It looks like it's getting an October 8 release here in Australia. I hope it's cinema and not just a DVD release. no 2 hangs in a lot of tube stations in london.... no 4 is the best. Any links to desktop wallpapers of these posters? Whoa, whoa, get out the way with that good informotain.